First introduced in 1896, the Nord Express traveled from Paris to Saint Petersburg, stopping in Brussels, Cologne, Hanover, Berlin, Konigsberg, and Daugavpils along the way. It was meant to connect with the Sud Express, also out of Paris, creating a direct link from Russia to Lisbon, where passengers could board ships to America. After World War I, the final stop changed from St. Petersburg to Warsaw, and then was shut down for good once World War II came around. 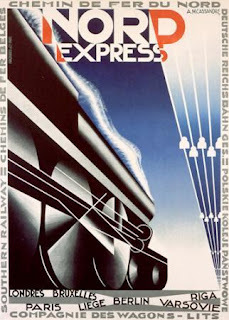 This poster shows how well Cassandre understood that with rail travel, you're selling the romance of far off horizons and the utter power of its speed. Although the viewer's eyes are focused on the rail, they are almost on the same level, focused on the seemingly distant, far off horizon. Using this angle of view, the dynamic power, speed, and huge size of the locomotive are expressed so beautifully.